In the last five months we have traveled to the states three times for medical reasons which are mentioned below. But first, a few news items from the Texas Panhandle. Nancy&apos;s sister and husband spent a few days with us and we had a good time. We also visited our two sons and nine grandchildren. We did some sightseeing in the canyons, and on March 22 we had a possible tornado situation. We were fortunate to have relatives next door who had a storm cellar. We stayed in it till the storm passed over. We go back to Ukraine March 27. We would appreciate your prayers as we plan and get back in the work over there. We plan, but we know God is in control of all and sometimes our plans have to change. There are still some medical issues to watch. The college is doing well and continues to grow. We are preparing for the summer children evangelism English club, but we still need one or two additional summer workers to help us. Because of limited housing, we can only take ladies (college age or so) who will live with Ukrainian and other American girls. Please feel free to tell anyone who may be interested in this ministry opportunity to contact us by email. On March 5, 2019 Ron had robotic assisted surgery at BSA in Amarillo, TX to remove his prostate gland which had a malignant tumor. It went well and the doctor was pleased. Amazingly, the next day Ron went home to rest and take it easy for three weeks; he was told to walk an hour every day which we still do most days. They cut five holes in his abdomen to access the prostate area and afterwards he was very sore. It was especially painful when he coughed or tightened the stomach muscles to raise up. The final doctor visit was March 21 and the doctor gave the OK for him to return to Ukraine March 27. The next doctor visit is not until January 2020. Also, on March 22 we found that Nancy has a problem with her lung. She is taking antibiotics, etc. for ten days and then she will be x-rayed again and see a lung specialist. She looks and feels good, but this is an important health issue so please continue to pray. 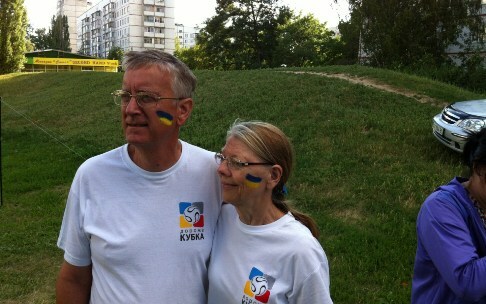 Thank you so much for helping us win Ukrainians for Christ. We count you among our dear friends. Pray for Peace in Ukraine.